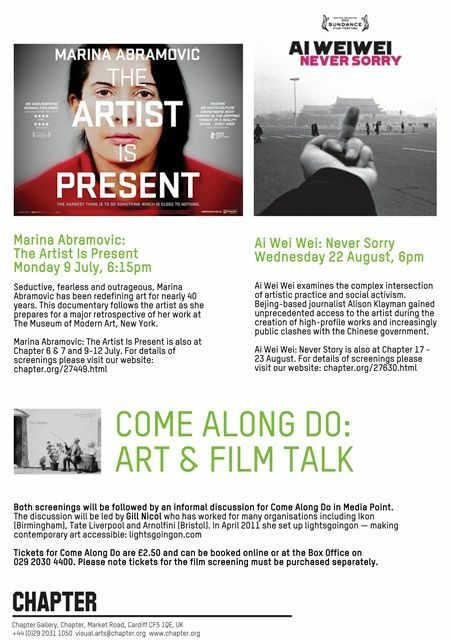 Please join us for our second event that will take Marina Abramovic: The Artist Is Present as the starting point for an in-depth and lively discussion that will continue our explorations in to the increasingly shared language around art & film practice. Seductive, fearless and outrageous, Marina Abramovic has been redefining art for nearly 40 years. This documentary follows the artist as she prepares for a major retrospective of her work at The Museum of Modern Art, New York. Tickets for Come Along Do are £2.50 and can be booked online or at the Box Office on 029 2030 4400. 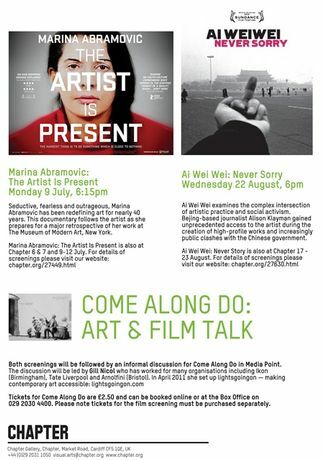 Please note tickets for the film screening must be purchased separately.